Released in early 2011 by Arc System Works for XBLA and PSN, Contra Hard Corps: Uprising is a bit of a departure from the classic Contra formula. While there's still nigh on endless waves of assorted enemies that get killed with a wide array of ridiculous weapons, HCU incorporated a life bar and leveling system. Also, no shirtless dudes. Despite this shortcoming it was very well received by critics and fans alike. Best Rising Mode time as Sayuri: 0:36:25 by Todd 'Mecha Richter' Foreman on 2011-05-24. Best Arcade Mode time as Krystal: 0:43:33 by Steve 'sutiibu' Laemont on 2014-01-08. Rising Mode as Sayuri: 0:36:25 by Todd Foreman. Hello everyone! First, I would like to say how excited I am to see a run that I have put a lot of work into published on SDA. Ever since the 100% 1:30 Metroid Prime run, I have been intrigued by speed running, but to get into speed running myself, I never considered it because I always doubted myself. Some people on this site are just awesome at speed running, and it shows in their runs. I always thought I would never be nearly as good as them, but there was something that made me decided I wanted to speed run, and it was something someone said during AGDQ and JRDQ. I don't remember who exactly it was, but it was basically a group of people talking about that. They said "if you don't think you can speed run, you're wrong. Anyone can do it, you just have be committed. No one here got as good as they are overnight. A lot of us went through a lot of trial and error to make a great run". For some reason, that stuck to me the most and it was then that I decided I was going to give it a shot. 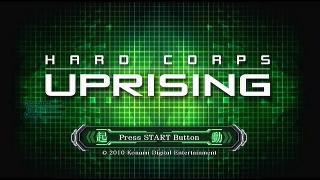 I decided to try out Hard Corps Uprising after I saw Jman/Houser's co-op Sayuri run. Despite a lot of comical mistakes (it's hard to run on co-op, so I forgive them :P), there were somethings I learned from the run, and after that, I just ran through the game over and over, finding new tricks everytime. But the thing that really got me into wanting to attempt the run seriously was the run I did during the JRDQ bonus stream. Everyone seemed to enjoy it, despite my sloppy attempt. It made me feel good inside seeing people enjoy something I put hard work into. I kept telling myself "I'm not going to work on a real run until I can finish the game under 37 minutes". I have gotten close to that goal multiple times, but I would choke really badly either at a major part in the game, or I would make little mistakes too much. This run, despite some mistakes I made, I feel satisfied with it because of how well level 7 and 8 went. Now, before go into detail about every individual stage, I'm going to explain what Rising Mode is, the differences between it and Arcade mode, and why the game looks more like a Strider game than a Contra game. First of all, Rising Mode, you basically start with the bare minimum. You play through the game earning points, which in return, you can purchase abilities in the shop. I play with all of the abilities equipped, including the 30 lives (this isn't a code), which isn't really benefitial to me (because God help me if I need 30 lives for a speedrun!!! ), I just leave it enabled all the time for when I'm practicing. Here are the abilities Sayuri has in Rising Mode over Arcade Mode. Rapid fire attack | You have to push that button really fast for results! Along with the rapid fire, your charge shot is also charged while attacking, which is really useful. There is also an ability Sayuri can learn that makes here invincible when she jumps (not available in Arcade Mode). This doesn't affect air dashing though. Just regular jumps. That is a big advantage that I use on a few levels (level 7, for example). Along with those, her vaulting/dodging, etc. abilities are also available in Arcade Mode. She also has a sort of super-punch that gives her a few frames of invincibility when used. I haven't found much use for it though. The reason the game looks more like Strider is because of the character I used during the run: Sayuri. She is the only character in the game that is like that (everyone else uses guns, just like Contra). Her sword is really powerful and can take out most bosses in little to no time. The reason I chose her was because of how powerful she really is. With other characters, they all use guns, can upgrade their guns if they get multiples of the same gun, and if they get hit once, they lose their gun, which is really bad in a speedrun. On top of that, the guns aren't that strong (apart from the laser, which suprisingly, is the best gun in the game). Sayuri doesn't have that problem since she doesn't have any pickups, so you don't have any slowdown trying to get new weapons, which is why I like Sayuri. She's simple: get to the end killing everything in your way! Now that that's all out of the way, I will get into detail for each level. Level 1 (3:00): You may notice a chime saying "Let's Rock" during the loading screen. That is a code I entered that is merely cosmetic. All it does is change the music of level 1 to a remix of NES Contra's level 1, which I like much better than the original song, so I use it. For those that are wondering, the code is the famous Konami Code. The stage itself was practically perfect. I have been able to get 3:00 pretty consistently and I'm certain there's no way to beat it in a faster time. Level 2 (2:25): Stage went along well, except for a small error on the helicoptor fight. I lost probably 2 seconds here. What happened was I was trying to grab on to the bottom of the helicoptor but jumped to high and hit the helicoptor. An important thing to note: I try to avoid purple flowers as much as possible because destroying them causes them to emit purple spores that will poison you if you come into contact with them. Not only that, while poisones, you can't run, only walk, which basically ruins your speed run. Level 3 (3:06): Another small error near the beginning of the level. I tried to air dash over the big guy but instead jumped a third time and grabbed onto the ceiling, resulting in on of the little robots knocking me down. Fortunately, the little robots do not inflict unless they latch onto you. Near the end, you'll notice I get knocked down again. This was actually intentional, though I was just trying to get knocked back and not knocked down, but that was because I was running and not walking. Anyway, I take damage so I have a temporary invincibility what I take advantage of to dash straight through the room with the rotating spikes. It's also faster to take damage during the boss fight than to dodge the lasers and use charge shots. Level 4 (6:07): There isn't much to mess up on this level since it's self-scrolling. It's possible to lose a lot of time on the tanker truck though if you don't take it out fast enough, it'll move into the background and launch large pipes towards you. If you get close enough, you can take it out really quick. The last boss of the stage could've went a little bit better, but I'm overall stasfied how it went. I take damage at the end of the fight on purpose because it's last formation is invincible until it starts spinning, so I take advantage of that by taking damage before it moves so my attack isn't interrupted when it starts spinning. Level 5 (3:09): This is the first error that really made me cringe and I'll explain why. In the area what I call the broiler room (right after the first miniboss), I accidently land on an enemy, which knocked me down and the conveyer belt rolled me to my demise. This normally isn't a big deal since it only cost me a couple seconds, but it's worse than that. For some reason, I don't know if it was intentional or not, but if you ever fall into a pit and die, you no longer have 2x attack power, it goes to 1x. It only happens when falling in pits and it isn't triggered by any other type of death. Fortunately, it only affects that stage unless you fall into a pit again on a different stage. This is obviously bad because bosses will take longer to beat, but usually only by a couple seconds. I was on the verge of scrapping this run when that happened, but I didn't lose any time during the boss fight which I was worried about the most because if you don't take out the left arm at the start of the fight, you can lose up to 15 seconds on the fight! Fortunately, I managed to take the left arm out quick and lost maybe a couple seconds on the boss fight. Level 6 (5:27): Another self-scrolling stage. This one is easier than level 4 because the bosses can be taken out really quick. I had an embarrasing death while dodging the fire stacks, but no time was lost. I almost botched the Arachne fight up because I climbed up too much and lost my grip on the train car. I only lost one second though. Level 7 (6:49): This level is one of the reasons I kept this run. Everything went so fluid and perfect (apart from a small error where I dashed into a small robot and got knocked down). Despite that, this is my best personal time for this stage. The first room where I'm climbing all the way up is a good place where you see me taking advantage of the invincibity jump. I use it to jump through the final electric barrior because it's too close to the wall just to climb through it. The others are. The second room with the electric barriors are too close to the wall to climb, so I have to jump through them. The chase sequence with Laviathan went perfectly, and was my favorite part of the run. I manage to dodge over the debris and over him. It's hard to outrun him like that but if you do, it saves a tremendous amount of time (about 20 seconds! ), because you don't have to wait for him at the end; he'll just magically be there waiting. Level 8 (6:28): This stage always makes me nervous during a run attempt because there are so many pits and falling in one makes you lose so much time, because it makes the fight with Vitis Engine last a lot longer. Fortunately, that never happened, and despite getting knocked down once when I landed on the airship, the fight with Vitis Engine drastically made up for it, mainly because I manage to defeat it in one rotation, which is the first time I managed to do that. Usually it takes two rotations to take him out. I grab onto the ceiling because Vitis Engine can't hit you from there. You have to leave one column in tact to be able to reach it though. The fight with Tiberius and his final forms were pretty straight-forward. They're really hard to mess up. Just make sure never to miss the helicoptor jump. ;) I was literally punching air when I saw the total clear time. It was a feeling of accomplishment and satisfaction that I rarely achieve, so I enjoyed every moment of it! Overall, the run went much better than I could have ever imagined! Despite my little mistakes and painful death on level 5, level 7 and 8 alone definitely made up for it! I hope you guys enjoy watching the run as much as I enjoyed playing the game! It's a fantastic game and it's only $15 on Xbox Live Arcade and Playstation Network, so if you have either systems, I highly recommend picking it up! It's a very fun game. Unfortunately, Sayuri is DLC, but she only costs a couple dollars and she is worth picking up! I would like to thank everyone that watched me practice on stream. Everyone's encouraging comments in the chat kept me from burning out! Also, I would like to thank a few XBox Live friends that motivated me throughout my attempts. Those people are Promo Ukyo, KS Skillet, Plasma SKX, TacNinja II, SN3AKY SAXO, Scratch W, NIREXINE, and Blink 187. You guys rock! I would also like to thank mikwuyma for walking me through the steps needed to submit a run, and also for giving me the opportunity to run HCU during the JRDQ stream! Next person I would like to thank is Nate for encoding my video. Most of the runs on the site would probably cease to be without your awesome encoding skills! Last, but not least, I would like to thank Radix for making such an awesome site! None of us would be here if it wasn't for you! Arcade Mode as Krystal: 0:43:33 by Steve Laemont.